Want a quick and dirty way to test whether your content is compelling? Is the teenager still reading, watching, or listening after 30 seconds? One minute? Five minutes? Fifteen? Thirty? Is the teenager happy, confused, or mad? Is the teenager your child? If your own teenager is still listening after 30 minutes — and is happy about it — you created some good content. Scientific fact for those who aren’t paying attention: written into the DNA of teenagers is a revulsion for anything adults do, especially their parents. So imagine trying to get your own daughter to listen to your presentation … and she actually ends up liking it. That’s what happened to Ann Handley. Content Rules, which Ann co-wrote with C. C. Chapman, is a best-seller that has been translated into nine languages, including Italian, Turkish, Chinese, Korean, and Portuguese. Before that, Ann co-founded ClickZ.com, which was one of the first sources of interactive marketing news and commentary. In the meantime Ann serves as Chief Content Officer (the first such position to ever exist) at MarketingProfs and blogs at AnnHandley.com (which used to be called “Annarchy” way back when … loved that name). Then there’s that part where Forbes magazine named Ann as the most influential woman in social media in 2011 — it sure helps she boasts more than 215,000 Twitter followers. Back in 2010 ForbesWoman named her one of the top 20 women bloggers. Let’s not forget she’s a member of the LinkedIn Influencer program (a role you need an invitation to get). And, oh yeah, she writes a monthly for Entrepreneur magazine. Yeah, but can Ann speak? Can she bring it to the podium? Just look at her testimonials and you’ll get the answer to that question. There’s one from a VP at JP Morgan. Another from a VP at Cisco. Senior Director at Marketo. Another VP at Kinvey. Nothing personal against Sophia or Buddy T., but Ann’s got testimonials that matter. Did I mention Ann is speaking at Authority Intensive? It’s true. She will be a treat (and hopefully wear her cape). Who am I? This question just threw me into a bit of soul-searching that took the better part of an hour, and that ultimately ended in me questioning the validity of my very existence. What is your area of expertise as a writer? I’m waging a war on mediocrity in marketing content. Wherever books are sold (Content Rules, anyway). Online: AnnHandley.com and MarketingProfs, mostly. I’m also a monthly columnist for Entrepreneur magazine, and you can find me on Twitter here and here. How much time, per day, do you read or do research? I don’t know. I’ve never tallied. And it depends whether I’m working on a project or not. Can I give non-answers? Or perhaps I just did? Also, can I answer a question with a question? I pay all my bills. I catch up on any movies or TV series I might’ve never gotten around to seeing. I change the oil in my car. I waste an hour or two on Facebook. I decide to make something really complicated for dinner. Then I leash up my dog and on the walk decide what the first line I’m going to write when I get back home will be. Do you prefer any particular music (or silence) while you write? Silence. If anyone is breathing nearby, I ask them to stop. Because it’s distracting. How many hours a day do you spend writing (excluding email, social media, etc.)? What is your most productive time of day? If I’m working on a project, I spend much of the weekend days writing, because I have a weekday job that keeps me pretty busy. If I’m not working on a project, I spend much of the weekend days feeling liberated and relieved and oddly guilty that I don’t have a project. My most productive time of day seems to be between 10 a.m. and 10:20 a.m. every morning: I’m still caffeinated from the morning and not yet distracted by thoughts of lunch. Do you write every day or adhere to any particular system? I try to write every day — in some capacity or another. It’s not always for public consumption, but it’s the best way for me to know what I think about something. No. “My father never got truck driver’s block,” as the journalist Roger Simon has said. I do believe in Writer’s Evasion — as all that business about changing the car oil suggests, above. I believe in Writer’s Difficulty and Writer’s Procrastination and Writer’s I Wonder If There’s Any Donuts Left I Should Go Check. But I don’t believe in Writer’s Block. This question would be easier if you made it multiple choice. But here goes: one part inspiration, one part motivation. E.B. White, Kate Atkinson, David Sedaris, Alexander McCall Smith, Joan Didion, Barbara Pym, Orhan Pamuk, and Roz Chast (who is mostly a cartoonist, but her work delights me). Who or what is your Muse at the moment? Right now, I’m working on a book about marketing and writing. So my “muse” is kind of a weird “anti-muse”: I’m tired of reading bad marketing content. Is “anti-muse” a thing? Empathy for the reader or audience, and a relentless focus on them. What hardware or typewriter model do you presently use? A quill pen crafted from a North African Lapwing and vellum from the skins of heirloom livestock. I kid –- a two-year-old MacBook Pro. What software do you use most for writing and general workflow? I just yesterday bought Scrivener (after Sonia Simone started talking about it on Facebook and then David Meerman Scott told me at lunch this week that it changed his writing life for the better). I’ll have to let you know how it goes. Do you have any tricks for beating procrastination? Do you adhere to deadlines? I am an excellent procrastinator. But I never miss hardly ever miss am pretty good at adhering to deadlines. Ultimately, my work ethic saves me. Even if I do most of the work while crying. What helps is what Seth Godin talked about in Linchpin: Pick a date, and SHIP! Regrets at not taking a risk. To me there’s no greater success than loving the life you’re living. Which I do. What’s your biggest aggravation at the moment (writing related or otherwise)? Never having enough time, and too many demands on the time I do have. George Eliot, because she lived in interesting times for women, and yet lived an extraordinary life on her own terms. I’m interested in her personal story perhaps more than anything else. But that’s not a dis of her writing; It’s just that I love reading (or in this case, potentially hearing) autobiographies. If you could take a vacation tomorrow to anywhere in the world, where would you go (cost or responsibilities are no object)? Someplace warm. Ideally on the coast of Greece or Italy. That I’m grateful to them for reading this far: Thank you. Every serious writer builds a shrine of some sort, whether it be picking the perfect table at a coffee shop, or carving out a quiet nook in your home, with which you hope to entertain the Muse. More Q&As are in the works from writers who inspire us, and if you care to sift through our archives, you can find more inspiration here. If you’ve already subscribed to Copyblogger via email or RSS, the next installment will be delivered to you just like the rest of our daily content. If not, go ahead and subscribe right now so you don’t miss a thing. Now set some ambitious deadlines and get back to work! See you out there. 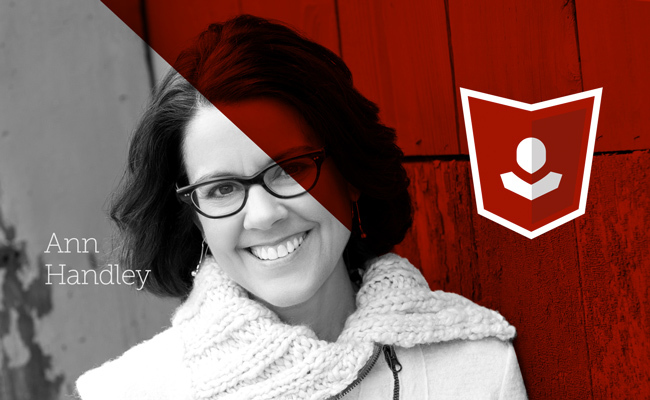 We are thrilled that Ann Handley will be speaking at our content marketing and networking event — Authority Intensive — taking place May 7-9, 2014, in Denver, Colorado. It’s currently sold out, but stay tuned for details on next year’s Authority Intensive! I do, too, Joseph. Thanks for your kind words. Thanks, Joseph! Fun to be here.. and thanks for your kind words. Will I see you in May? I think we have all felt the pressure of time constraints before. Some people really thrive on that kind of pressure but I think doing things last minute is asking for trouble. I know that I can work and hit tight deadlines, but I prefer to not kill myself to get it done! I like the idea of showing your content to a teenager to check if it is compelling. I think it will work in most cases and is really good when writing for masses (like blogging). However, a quite serious or a specific topics in some cases are better to write in a different style (which does not target masses). For example, if I am a specialist in a specific filed, I may be looking for a serious article that resolves the question I need. I don’t need an amusing and a fun reading, but just condensed and to the point information in this case. But on the other hand, you are right again when it goes about over-complication things. Even Albert Einstein said that everything should be made as simple as possible, but not simpler. All successful communication is clear, concise, and compelling. It doesn’t mean it has to be fun. A teenager should be able to read it and understand it. But it helps if you have a sense of humor. The Nobel Prize economist Paul Krugman has been taking his colleagues to task over this issue. If people outside your field can’t understand you, you probably don’t understand yourself. Thanks for interviewing Ann. I’m ashamed to say I had never heard of her, but now I’m excited to get her book Content Rules! She sounds like one person I would like to learn as much as possible from, so I’ll also be reading her blogs. I like her sense of humor. With all the millions of blogs out there these days, it’s really important to make our own as unique and interesting as possible. If I can pick up any tips from her, I’ll be all over it. I like the idea of writing with the idea of keeping a teen-ager’s interest. I don’t have any kids, so hadn’t thought of that perspective before, but I’ll keep that in mind now as I write. Thanks for all the great tips and ideas here. so true that the reader doesn’t turn the page to applaud, he turns it to be entertained, to learn something. Thank you for this top level explanation from Ann. I absolutely LOVE her sense of humour. YES! I do too. If you read through the past Writer Files this will jump out at you: they all are funny and self-effacing. Hilarious. Love the #boss gapingvoid sticker on the laptop. Excellent interview with Ann Demian. It’s always great to get insights from those marketers whose writings we follow and admire online. Very entertaining and well written. Thanks for posting this. Love Ann’s expertise as a writer. “Not enough time” aggravates me to no end… and I manage the time I do have very well. So, I suppose I try to be “content” with what I do with the time I do have… it doesn’t work very well, but it is a consolation of some sort. This was a great look into the life of a great writer, Ann… thank you. Hmmmm… I’m gonna go write something now. Love the response to what makes a great writer “Empathy for the reader or audience, and a relentless focus on them.” Yes yes yes!! Damn fine interview right there. Kudos to both the subject and the writer for an enlightening read. And bonus points for #shelfies. I’m so glad I got my ticket to the conference when I did. Looking forward to hearing Ann speak along with so many other very cool and talented people. It’s true… Ann once asked me to stop breathing. And I was like, “Ann Handley just asked me to stop breathing!” It was a big deal. Listen here, Dane: You went a little over the top with that Tumblr you launched AnnSaysStopBreathing. That wasn’t funny. More reason to -stalk- _ahem_ appreciate Ann Handley: She writes with a 2 year old MacBook Pro and has been successfully converted to the cult of Scrivener. This makes us practically related, right? Ann’s freshness and fun only adds to her Authority and authenticity. Can a woman be funny and formidable? For the second time today, I am answering that question with a yes, yes, yes! Demian – you are mine. The best interviewers don’t get enough credit, because they (umm… you) make the interviewee look good… so you deserve a lot of credit here! Love Scrivener. I use just a few of the features but it’s my go-to writing software, for sure. Haha! Thanks for sharing that quote. It made me laugh, even though I honestly don’t agree with it. Writing requires a lot of focus and eats up a lot of glucose in the brain. I understand one needs focus to drive, but you can still do 3/4 of driving in your subconscious. Writing is not something anyone can do subconsciously (at least for long). It’s almost always a conscious, energy draining practice. So, in my opinion, that’s what writer’s block comes down to — just the ability to focus. Anyway, great interview! I enjoyed reading it. You don’t think truck drivers need to focus?! Every occupation needs to focus at the task at hand. If not, they don’t last long. I think my bigger “truck driver” point is that writing is a muscle that needs work (and rest). What makes it good is simply doing it consistently with purpose and caring and empathy for the reader — not an infusion of some murky bit of magic that the notion of “writer’s block” suggests. I adore this series and especially enjoyed your hilarious answers, Ann. Thanks for another great piece, Demian! The target audience of the blog I manage IS teenagers/twentysomethings, so I would LOVE for your daughter to take a look at it and share her thoughts. In any event, I’ll be at the Authority Intensive and look forward to hearing you speak then! Excellent. My kid won’t be coming with me… but perhaps we can arrange a Skype consultation… LOL. Awesome. Simply awesome. I think the line about being empathic and constantly focusing on the reader is a gem. Often times we get caught up in trying to show what we know rather than helping. Oh, and I just bought the Content Rules book. Looking forward to reading it! Amen on silence Demian. Ideas flow freely from fingers to keyboard to Word Doc when I sit in quiet. Music and all other noise distracts me. Practice writing. Practice writing. Practice writing. I post 5 times daily. 2-3 vids usually and 1-2 articles. Why? Writing makes me a better writer and content creator. I would add that going overboard leads to burnout. Practice, rest and let your creative juices flow during down time. I took today off. I hopped online at 6:30 tonight. So no late night sessions because I need to rest, relax, and hit the cyber world hard again tomorrow. Nice, Stephen! And thanks for your kind words. Hey whatever works! I’ve just found that strategy, design, heck even random thoughts that pop into my head all flow easier and lead to another cool idea when I doodle them in color instead of just typing a note on my computer. Exactly — whatever works. As long as we do. Loved reading through this interview. Ann, your answer to this question made me stop and think . . . and analyze myself. “What do you see as your greatest success in life? The reason it made me think and analyze is because I love the life I’m living on so many levels even though they all seem to pull me in different directions. The other thing I loved was your answer to this one: “Before you begin to write, do you have any pre-game rituals or practices?” Don’t we all? Anne, how is your journey with Scrivener going? I have heard a lot of good things about it. Has it changed your writing life as it did for David. Thanks for a great interview Demian.